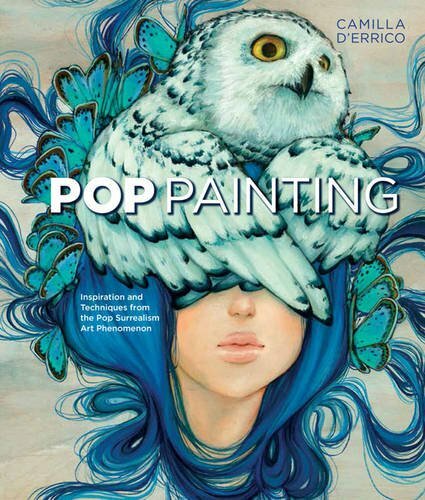 Pop Painting is a really insightful guide that goes behind the scenes to show you the painting process of Camilla d'Errico, one of the better known artists in the world of Pop Surrealism art. I've seen her artwork online quite often, and in other artbooks. I've always thought that Pop Surrealism is similar to Lowbrow but Camilla actually defines it a bit differently, saying that Pop Surrealism "has brighter, more whimsical, and more playful nature". This is actually an art movement that baffles me. But I do appreciate the artists who paint in this style because it adds variety to art in general, and that's a good thing. There is a lot of information in this 238-page paperback. First half of the book is Camilla talking about her inspiration and workflow, things like where she finds inspiration, thinking as a painter, the materials that she uses, and also subject matter. There are also lots of techniques being discussed. Second half of the book are step-by-step examples from her paintings. There are 19 paintings featured where she demonstrates and explains her process and techniques. Each painting actually focuses on a specific area, for example, a painting could be a portrait, but that example might talk specifically about drawing the hair perhaps, and in another paintings, it could be about eyes, or lips or other things. The painting demonstrations are split into subject matter namely: humans, animals, melting effects and twisting reality. I'll recommend this to fans of Camilla d'Errico and Pop Surrealism. Camilla is very generous with sharing her knowledge to benefit other others. Highly recommended.